Scratch and the MaKey MaKey are like chocolate and peanut butter – two great tastes that taste great together. 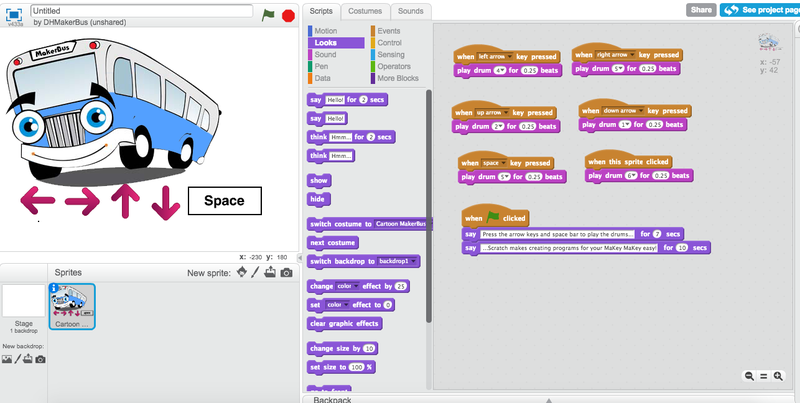 Using Scratch (a kid-friendly visual programming language developed by MIT) you can make custom programs for your MaKey MaKey (a circuit-based invention kit) in minutes. Together these two tools create the perfect STEAM learning experience, blending programming, learning about circuits, and music. In a nutshell, the MaKey MaKey is a small USB-powered circuit board that allows users to turn anything that conducts electricity into an input for a computer. The classic MaKey MaKey project is turning bananas into a piano. Since both bananas and people conduct electricity, by touching the banana, the user completes the circuit, sending a signal to the computer which triggers the playing of a note on a piano. Even if you’ve never creating a program in Scratch before, you can design custom programs for your MaKey MaKey. Using the “Event” command “When ______ key pressed” and the “Sound” command “Play drum ___ for ____ beats” you can create a custom drum program in moments. By clicking on the “Events” tab in the “Scripts” menu, you can select “When [space] key pressed” command and drag it into the creation window on the left side of the screen. Once you’ve dragged this command into the creation window, you can click on the command to choose which key you would like to use as a trigger. By default the MaKey MaKey uses the up, down, left, and right arrows as well as the spacebar and the left mouse button. Then click on the “Sound” tab in the “Scripts” menu and drag the “play drum ___ for ___ beats” command into the creation window. By dragging these two commands together, you’ve made one trigger for your MaKey MaKey. Repeat this process until you’ve made as many triggers as you want. The finished product for our custom MaKey MaKey drum set looks like this, please feel free to copy it to create your own. If you want to make your custom instrument even cooler, try experimenting with the sound recording option and try creating your own custom sounds. Just imagine how much fun children would have recording the notes of their own music instrument! Check out our custom MaKey MaKey drum set.